For some of us the battle for clear skin is a fight into our adulthood. There are many factors that trigger acne, poor diet to hormones to stress are some of the common causes. To get really healthy clear skin on the outside, it all starts with the inside. Proper nutrition, along with water are the first steps to get the skin you want. So before you run to the drug store, your answer to clear skin could be in your garden. Below we list some of the best “skin foods” you can eat and use for beautiful clear skin. This versatile vegetable is loaded with iron and vitamin B1, and both help to improve your skin’s complexion. The skin is also a great source of fiber and many would be surprised to learn that fiber helps rid your skin of acne. You can roast it or bake it, either way eggplant is a perfect addition to your diet. It’s a great substitute for meat. If you are suffering from uneven skin tone and want an all-natural toner, eggplant juice can help even out your skin. Juice the eggplant (it may take you more than one to get a full glass), then add a teaspoon of vinegar to keep the mixture longer. Place the juice in a glass jar and refrigerate. Every morning use a cotton ball to apply the eggplant juice to your face. You’re probably already crunching on this vegetable but if you’re not you should! Carrots are easy to grow and why not try carrot noodles for a low carb alternative. Carrots are high in vitamin A, which can increase your metabolism and help to develop tissue that keeps skin firm and healthy. Try a carrot mask. Chop a carrot into round pieces and boil. Drain the water and place the cooked pieces in a bowl. Mash the carrot up well, and slowly add a half of tablespoon of honey while continuing to stir. If you have dry skin, you can also add a half of teaspoon of olive oil. If your mixture is too runny, add more honey or olive oil. Let the mask cool down before applying. Once, the mask has cooled apply all over your face (avoiding the eye and mouth). Leave the carrot mask on for 10 minutes and wash it off with warm water. In general potatoes get a bad rap, but sweet potatoes offer so much goodness they’re the perfect addition to any diet. Contrary to popular belief, this complex carbohydrate does help you lose weight. The fiber keeps you full and the vitamin A keeps your eyes healthy as well. If you are suffering from dry skin or dark circles, a sweet potato mask may be the answer to your prayers. Make this sweet potato mask: Boil the sweet potatoes, remove the skin and mash them in a small bowl. Add to the sweet potatoes a tablespoon of honey and a few drops of lemon juice. Apply the mask, once cooled, to a clean face; let it sit for 20 minutes and remove with warm water. Garlic can clear clogged pores! Eating garlic can give your breath a strong odor, but the pros outweigh the cons when it comes to this powerful vegetable bulb. Garlic can help strengthen you immune system and help reduce your blood pressure. Adding garlic to your diet is so easy! You can use garlic in your sauces, meats, or even add it to your salad dressing. If you’re suffering from acne, a garlic mask might be your best bet. 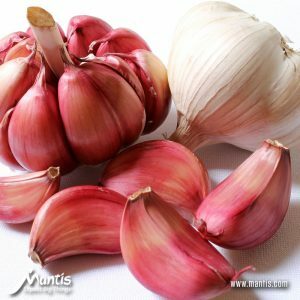 It’s really simple: mince four peeled cloves of garlic, apply it to your affected areas, leave for a few minutes (you might experience some stinging), and remove with cold water. Garlic’s anti-bacterial properties is the perfect remedy for clogged pores. Remember, great skin comes from the inside. Make sure you’re incorporating fruits and vegetables into your diet daily. Also it is important that you’re getting plenty of water and sleep. The saying is true: great skin starts on the inside! With any mask you choose, do a skin test first to ensure you do not have any allergic reactions. The best face masks are those made with fresh organic vegetables and why not grow them? By growing your own food, you know exactly what you’re getting – just one more reason to start your own garden.